Image from Taiwanese President Tsai Ing-wen's facebook. Chinese President Xi Jinping said  that Taiwan's unification with China is crucial for China's grand political project of “rejuvenation “, stressing that while peaceful unification is ideal, Beijing will not rule out the use of military force. Speaking at the commemoration gathering of the 40th anniversary of cross-strait dialogue on January 3, Xi went on to say unification should mirror Hong Kong's model of “one country, two systems,” in alignment with the 1992 consensus . He added that the Taiwan problem “could not keep passing on from generation to generation”. Taiwan has been a de-facto self-ruling state since 1949 when the Kuomintang (KMT) was defeated in the Chinese Civil War and subsequently relocated to the island. In 1992, the KMT signed a “One China” consensus with Beijing, in which both parties have agreed that both mainland China and Taiwan constitute a single country — but interpretations of what that consensus entails are very disputed. 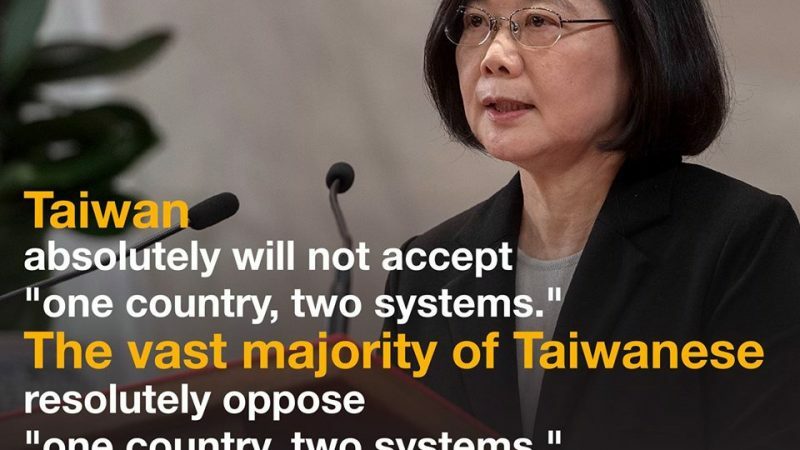 The result of the implementation of ‘One Country, Two Systems’ in Hong Kong is the loss of freedom, rule of law and human rights of Hong Kong people – this is unacceptable to the Taiwanese people. Many in Hong Kong believe that the principle of the “One Country, Two Systems,” written on the 1984 Sino-British Joint Declaration and Basic Law, has failed to protect Hong Kong citizens’ rights and freedoms. In recent years, Beijing has harshly interfered in Hong Kong's internal affairs. In 2014, it decided to confine  the election framework to Hong Kong's Chief Executive. In 2015, five Hong Kong booksellers  disappeared in what is widely believed to be extrajudicial detentions by China's security forces. Between 2016 and 2018, six pro-democracy lawmakers were unseated under Beijing's auspices. Xi's speech indicates that the CCP has fundamentally changed its policy towards Taiwan. In the past, it had sticked with the “1992 consensus”, the consensus is rather ambivalent on who would lead the unification. It stresses equality in cross-strait talks. This time, Xi refers to “one country, two systems” as reunification strategy, this is an open declaration that the CCP will control Taiwan’s sovereignty, while Taiwan will be allowed to retain its own system. Excerpt of an article. When compared with the speech delivered by Hu Jintao [former Chinese President] at the 30th anniversary  [of cross strait dialogue], Xi Jinping’s speech presents three major changes: 1. Xi stresses that China would not abandon the use of military force, Hu did not mention any military means; 2. Xi refers to “one country, two systems” as a reunification model, Hu stressed cross-strait negotiation; 3. Xi does not mention mutual trust, Hu stressed the building of trust in different arenas, including political and military. As soon as Taiwan and China are unified, [there will be] no space for negotiation, no freedom, no democracy. Taiwan’s economy could only be integrated with China. The 70 years of Taiwan’s efforts for independent development would come to an end. Tsai Ing-wen is too defensive. Although Taiwan is now in a safe corner, it can’t be secured in the long run. A more powerful Taiwan politician should issue regular letters to mainland Chinese advocating for democratic constitution for the unification of China. This can provide space for Taiwan to intervene in domestic affairs in China, as well as give suggestions and make criticisms to the public agenda regarding issues such as respect for human rights in China. Instead of being defensive, it can be more proactive in winning the support of mainland Chinese people. This can ensure Taiwan’s security and will help make history that could change the world. If Taiwan’s Democratic Progressive Party follows your suggestion, it would become KMT in the old days. There is nothing new in your suggestion, but it fails to address why Taiwan has a pro-independence movement in the first place. The fact that [Taiwan] made the choice to walk the path towards independence means that it wants to cut linkage with its origin. Like marriage, when the bond is broken, the relation is no longer directed by love nor hate, it is indifferent. [We must unify Taiwan] Taiwanese must eat pork with African swine flu, poisonous food, gutter oil; they must breathe in poisonous air. Their welfare must be abolished so that they cannot afford to be sick, to have education and to buy a home. Let Taiwan adopts the parallel political system (party and government), let their government and party officials have privilege while people live like dogs and pigs. Brainwash the Taiwanese so that they cannot criticise and only capable of praising the idiots. Hong Kong netizen: As a Hongkonger, I urge Taiwanese people to never believe in CCP’s “one country, two systems”, it is a means to penetrate Taiwan, once they take control, they can do whatever they want and will cut you into pieces. All the political incidents that have happened after Hong Kong's handover to China in 1997 have showed the consequences. The democracy that you are enjoying now was paid with the lives of KMT’s soldiers during the civil war. Please protect the only Chinese democratic space in this world.